It's been a day of discoveries, I'm stopping now I've got to ten. 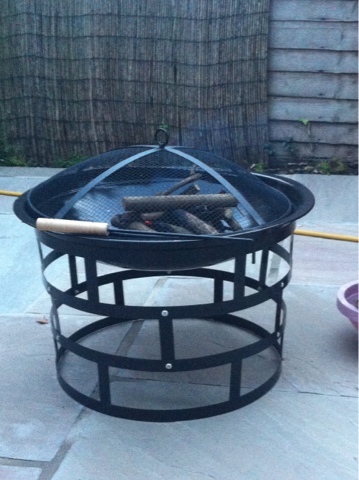 Now we have the fire pit, barbecue and a bottle of wine on the go. All under MOH'a jurisdiction. Perfect. 1. The indoor waterfall in the study (thankfully not discovered first-hand, and thankfully told about by the decorator), see earlier post for details. 2. Out kitchen tap has been plumbed in incorrectly. The hot lever dispenses cold water and the cold lever hot. Surely it isn't that hard to get right? 3. The new sink leaks a bit too. 4. How to work the new washing machine! That means we have clean clothes, yippee! 5. 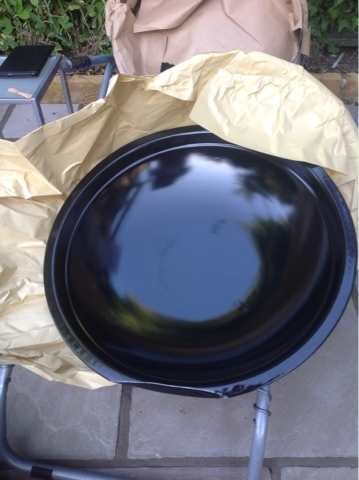 How to set-up and work the new dishwasher, that means no more washing up in the bath for MOH! 6. A "post bit" for the radiator cover (now back in place, almost) is missing and despite various pots of "Useful Bits" MOH either doesn't have one, or can't locate it. 7. Plasterboard and other builder-type rubbish in our green bin (the bin for food and garden waste only). 9. Where the new fridge-freezer backs on to a custom-made bookcase, one of the shelves has split. That's because the shelf and the fridge-freezer are now attached. There'll need to be a plan B for this one as I'm pretty sure the fridge-freezer wont be coming out! 10. 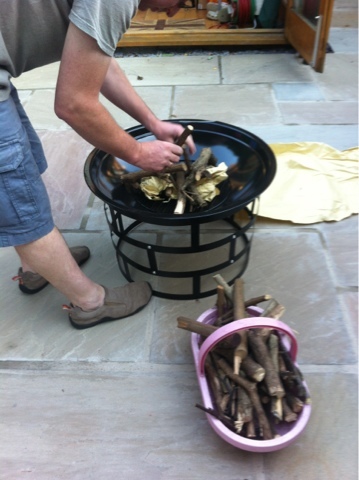 As it's a bit chillier than it has been (it's still 23 degrees) MOH decided to assemble the fire pit that he had for his birthday. Straight out of the box, and it's damaged (look at the bottom edge!). We're clearly having a run of bad luck! 1. A disappearing duster. I thought I'd washed two but can only find one. Who knows where this has gone! Found it! After convincing myself I couldn't have washed two I must have left it in some random place, that would most likely amuse me when I eventually found it. Well, I should have had more courage in my convictions, I've just found it nestled in the shoulder of one of MOH's t-shirts as it hung on the line. I knew he had it all along!